Today's post takes me back about 16 years. Back to when I first started working (gosh I feel old now). Back then, our meals were taken care off by the work place. And for me that was novelty because growing up we almost never ate out. My mum would cook up every meal and snack for us at home and as kids we were content with that. But eating in the office cafeteria was interesting. Here, I was introduced to such a variety of food from different parts of the country (India). But I wasn't too keen on cooking then. During those days I only enjoyed making our traditional Goan sweets (Kuswar) for Christmas and other Goan sweets that my Nana would whip up for us for afternoon tea or an after school snack. One of the dishes I encountered in the office cafeteria, that eventually became a favorite, was Methi Malai Matar (meaning Grean Peas in a Creamy fenugreek gravy.) It has strong Indian flavors but is mildly spiced. After moving to Sydney, I began craving some of this stuff. And it was only then I decided I was going to have to learn to make this dish myself, much like I had to learn so many other Indian recipes that I wanted to enjoy. Now the challenge was finding fresh Fenugreek leaves. The only place I've found fresh leaves is at one vendor at the Paddy's Market in Flemington. But that's a long drive from us. So I thought I'd try and find a recipe that used dried leaves (known as Kasoori Methi ) which is easily available at any Indian grocery store. And let me tell you, I found one. I couldn't believe how easy this little curry is to put together. With just a handful of ingredients, in less than half an hour you can be sitting down to a warm bowl of Methi Malai Matar for dinner. This goes really well with roti / chapatis, but you can also enjoy this with some bread or plain rice. Soak the cashewnuts in a couple of tablespoons of milk for about 15 minutes. Grind this to a smooth paste and keep aside. In a pot / saucepan heat the oil on medium heat. Add the cumin seeds to the oil. When the cumin seeds start to sizzle, add the ginger garlic paste and green chillies and saute for a minute. Now, add the chopped onions and saute till they've slightly browned. Add the cashew paste and fry it for a couple of minutes, stirring to avoid burning. Now add the turmeric powder, red chilly powder and the garam masala powder. Add salt to taste and stir well. Now add the rest of the milk and stir. Let it come to a boil and then simmer for about 2-3 minutes and the gravy will start thickening. Now add the green peas. Let the peas heat through and let the gravy come to a boil again. Now add the kasoori methi and stir. If the gravy is too thick at this stage, add a little water to achieve desired consistency. Just make sure the gravy comes to a boil after the water is added and simmer for a couple of minutes. If the gravy is not thick enough, let it continue cooking, stirring occasionally, till it thickens to your liking. 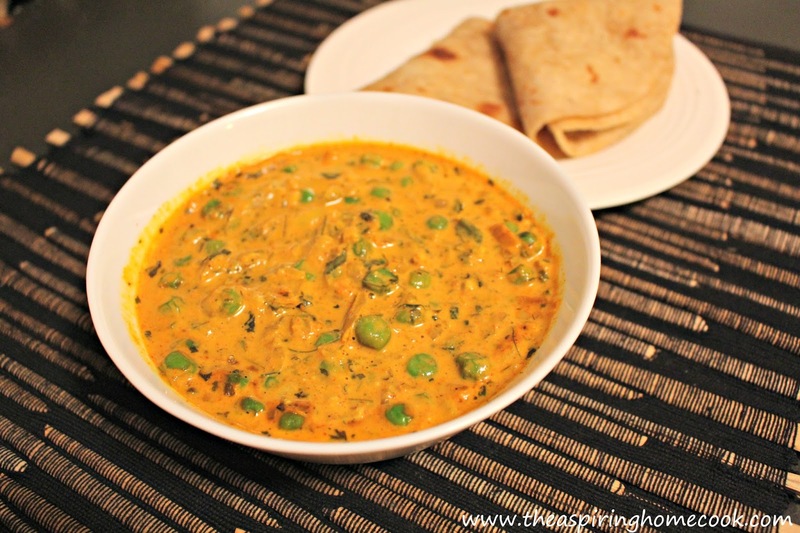 Serve hot with rotis / chapatis.